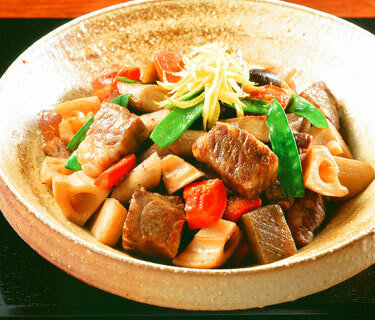 "Chikuzen-ni" is a stewed dish originally from the Kyushu Region. It is particularly tasty when left to sit some time after cooking and keeps well. This is why it is a staple dish that is prepared ahead of time for the New Year holiday when women are traditionally freed from kitchen work. Although chicken is usually used for chikuzen-ni , here we use tender Hakata Wagyu with a refined taste so as to make a luxurious dish. 1) Cut beef into cubes approximately 1 in. (2-3cm) in size. 2) Peel lotus root and carrot and cut coarsely. Rinse burdock thoroughly and cut coarsely as well. 3) Cut konjac into cubes approximately 1 in. (2-3cm) size. Make cuts on the surface so as to allow the flavor to permeate well. 4) Soak dried shiitake mushrooms until softened. Cut into quarters. 5) Grease a pot with cooking oil. Lightly sauté vegetables prepared in (2) through (4) and konjac and take them out. 6) Pour stock in the pot over heat. Add beef and cook slowly and thoroughly over low heat. When beef becomes sufficiently tender to allow chopsticks to be poked in smoothly, take it out temporarily. 7) Return the ingredients prepared in (5) to stock. Cook over high heat with drop lid. 8) When the stock is boiled down to about half the original amount, return the beef to the stock. When the liquid is almost gone, add soft-shell peas with fibers removed. 9) Remove from heat when the liquid is completely gone. Serve generously in a large bowl. Garnish with fine juliennes of yuzu peel. Hakata Wagyu is a Wagyu carefully raised over a period of about 20 months in Fukuoka Prefecture after being delivered from various parts in Kyushu as calves. The meat of Hakata Wagyu cattle, which are raised on grains only, is very soft and tender. The fat is not too rich but tasty on its own. Dried shiitake mushroom softens after being soaked in water for a while. The soaked water contains shiitake mushroom extract, and as such is sometimes used as a cooking broth.